The ground is situated in a picturesque park, called Stair Park, hence the name of the ground. The Club have been playing in the park since in 1907, and the park itself even has a bandstand. The ground has seen a lot of improvements in recent years. In 1995 a new Main (South) Stand was constructed at one side of the pitch, built by Barr Construction, at a cost of £500,000. This smart looking covered all seater stand, runs for roughly half the length of the pitch and straddles the half way line. There is a small amount of terracing on each side of the stand. From the back of the Main Stand, you can enjoy good views of the surrounding area to the sea. 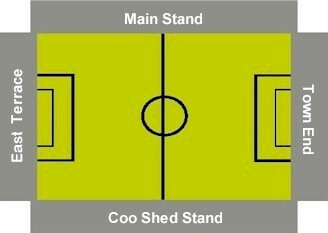 On the other side is a small stand, that is affectionately known as the 'Coo Shed'. This is a small covered stand, that has open terracing on either side of it, as well as a standing area in front. In the rear of this stand, are a number of rows of wooden benches. There are also a couple of supporting pillars in this stand. The Town End at one end of the ground is a small covered terrace, whilst at the other end, there is a small open terrace. At the back of this terrace are a number of trees and bushes, which gives the ground a rural look and I noticed a couple of kids seemed to be permanently employed during the game retrieving match balls from the undergrowth (the forwards were not having a good day on my visit!). There is also a small club shop within the ground, at one side of the Town End. It is also worth mentioning that the pitch is somewhat uneven in places. There is no club bar at the ground, however the ground is only a five minute walk away from the town centre where there are plenty of bars and eating establishments. As you leave Stair Park, turn left onto the main road to take you down to the town centre. The nearest bar is down on the right, in the Rudicot Hotel. This has a small quiet bar, which has a separate entrance on the side of the hotel. The bar serves a good pint of real ale (Deuchars IPA). If you continue down into the town centre then the next bar that you come to is 'The Pub' on the left hand side. This is a fair sized bar with TV's and a pool table. There is a chippy and cafe on the same side of the road. Colin Ferguson adds; 'probably the best bet for a drink before the game, is the Stranraer FC Social Club which is situated in North Strand St'. There is free car parking in the park surrounding the ground. Stranraer station is a fifteen minute walk away from the ground. From the railway station you should walk up to the ferry terminal building, opposite North West Castle Hotel. Turn left walk about 150 yards to the 'Craig n Elder' Hotel. Turn right onto Stair Drive . At the end of Stair Drive turn left. This takes you onto London Road walk for about 200yards and Stair Park is on the right hand side actually inside the public park. Thanks to J McCallum for providing the above directions. Queen Of The South & Ayr United. Main Stand (seating): Adults £12, Concessions £6. Rest of ground (terrace): Adults £10, Concessions £5. For the Stranraer fixture list click here (to take you to the BBC Sports Website). If you require hotel accommodation in the area then first try a hotel booking service provided by Football Hotels who are powered by Activehotels, who specialise in locating accommodation near or within a short travelling distance of the football ground. They also have the added advantage over some other hotel booking services that you pay on departure. Yes this site will earn a small commission if you book through them, but it will go to help with the running costs of keeping the Guide going. To access their Stranraer page click here.